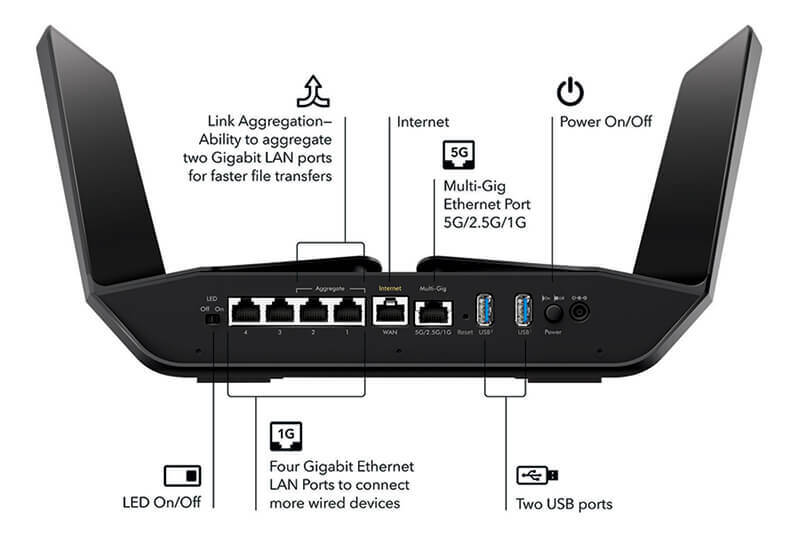 Formerly recognized for their antenna arrays, Netgear's Nighthawk series of wireless routers are in for an update. 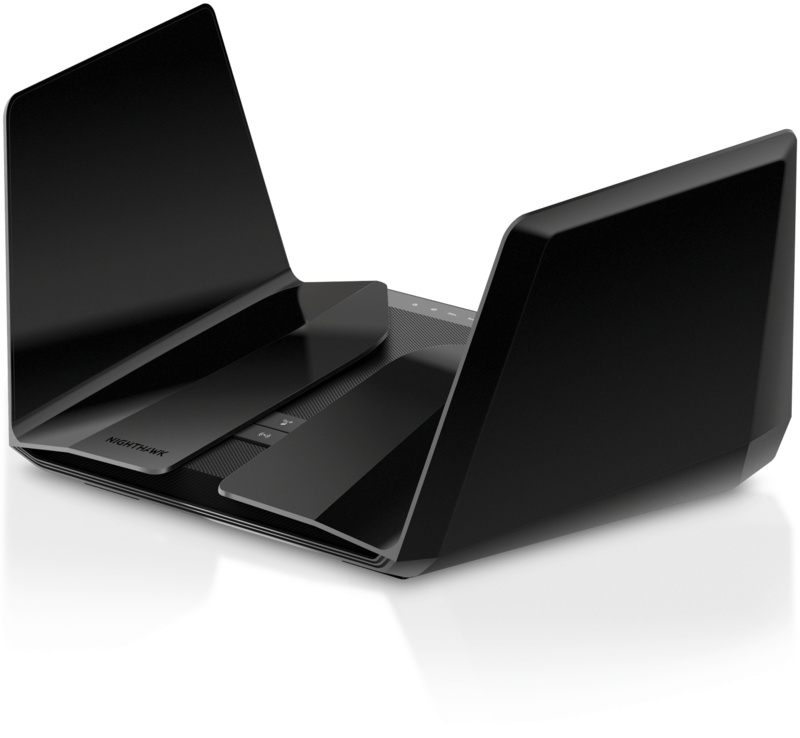 Bringing WiFi 6, formerly known as 802.11ax, to mainstream availability, the Nighthawk AX8 and AX12 trade several visible antennas for an enclosed winged design. According to Netgear, the new design allows for the antennas to be optimally placed for the majority of users without having to worry about repositioning movable antennas. Naming for each model derives from the number of streams present. The AX8 has four 2.4GHz streams and four 5GHz streams. Similarly for the AX12, it has four 2.4GHz streams and eight at 5GHz. Powering the AX8 is a 1.8GHz quad-core processor compared the the 2.2GHz quad-core processor in the AX12. Each of the routers can handle passing 6Gbps of traffic over wireless with up to 25 percent greater efficiency as a result of 1024 QAM. Both have two USB 3.0 ports and also support link aggregation on gigabit ethernet ports. The AX12 shown above features a 1G/2.5G/5G ethernet port as well. The WAN port for internet is 5G-capable on both models. One other standout feature of the AX12 is support for WPA3. Stronger encryption options and greater resilience to common attack vectors provide a more secure environment, especially when guest networks are setup without a password. On these premium products, plenty of other features such as beamforming and support for Alexa and Google Assistant control are available. If all of that sounds too good for you to afford, you may be right. The Nighthawk AX8 is will begin shipping on December 21 for $400 while the AX12 is still listed as "coming soon" without any indication as to how many kidneys it will require. Looking for a router now? Check out the Best Routers of 2018 that are currently available. The GOTCHA is that existing devices do not support the WiFi-6 and you will need ALL NEW devices to see any improvements in bandwidth. The AX8 model will see it added via firmware updates from what I've read. So if it is indeed hardware based it's there just not functional yet.